Combine all ingredients in a small mixing bowl. Stir with a fork to evenly mix. Season to taste with salt and pepper. Combine vinegar and shallot in a small mixing bowl and let stand for 30 minutes. While whisking, slowly add the olive oil. Season to taste with salt and pepper. Strain to remove shallot. Set a large pot half full with water on stove and bring the temperature to 165°F.While water is heating, take each chicken half and remove the breast from the skin. Season liberally with salt and black pepper. Flip the breast 180° and place atop the thigh so that the larger part of the breast fills in the smaller parts of the thigh. Lay an 18-inch long double layer of plastic wrap on a smooth surface. Center a chicken half on the plastic wrap near the edge closest to you. Slowly roll the chicken in the plastic wrap, pulling towards you to create a tight seal. Roll the chicken on the work surface while holding one end of the plastic to create a tight rope. Tie the plastic wrap in a knot and repeat with the other 3 halves. Once all chickens are sealed in plastic, drop them in the 165°F water and cook them until they reach the internal temperature of 140°F on a probe thermometer. Immediately remove chicken from pot and chill it in ice water. Preheat oven to 450°F. Unwrap all four chicken halves and discard the plastic. Heat sauté pan over medium heat. Add olive oil and when traces of smoke appear, add two half chickens. Brown each side and finish in the oven until warmed through. In a large salad bowl, combine bread, greens, peppers, and cherry tomatoes. Add balsamic vinaigrette and toss to evenly coat. When chickens are heated through, remove from pan and slice into ¼-inch thick discs. Place a mound of salad on each of 4 plates and top with sliced roulade. 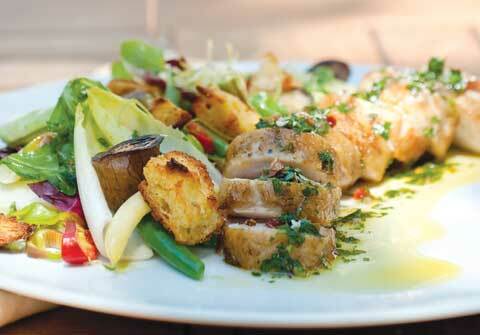 Generously spoon the salsa verde over chicken roulade and plate.